Accountability and security are essential for the reliable transport of evidence. Ensure every piece of evidence reaches its intended destination using Sirchie's® Kraft Evidence Bag. Each bag is pre-printed in blank ink with chain of possession and carrier identification fields to ensure every leg of its journey is accounted. Instant-bond security tape is included to seal bags and prevent evidence tampering. Constructed from a highly durable and breathable material, the Kraft Bags ensure each item transported arrives in the same condition it was collected. 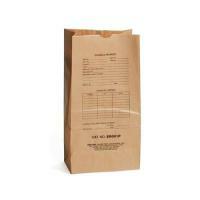 Measuring 7 x 4.5 x 13.75-inches, the bags are ideal for small to medium-sized items, including most handguns and knives.